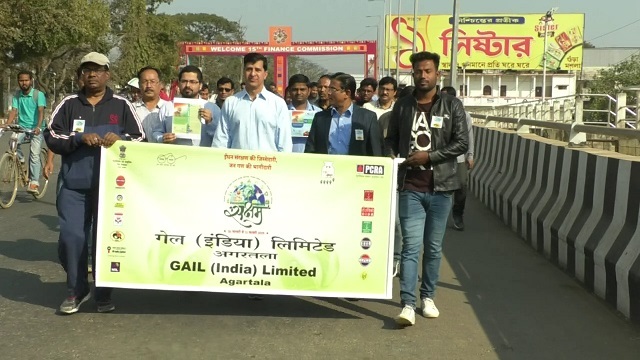 GAIL (India) Limited in Agartala in association with the Petroleum Conservation Research Association (PCRA) conducted cyclathon, a cycle rally which is aimed towards spreading awareness about fuel conservation and health benefits of cycling. The mission of the month-long cycle rally which was launched on January 16 and participated by all oil and gas companies was to promote cycling for reducing petroleum consumption and thereby reducing pollution. Several cycle enthusiasts from a diverse set of age groups took part in the cyclathon. General manager of GAIL, Lalit Maurya said that petroleum reserve is very limited and its consumption is much faster than its rate of formation and so there is urgent need to conserve oil and gas besides aware people to use it efficiently so that it can last for a longer period of time. He suggested for improving the fuel-efficient techniques in the transport sector and spreading awareness among the people using oil and in the transport sector that accounts for fifty percent of the petroleum consumption in the country. This year’s theme for the event was ‘me hum saksham‘ to highlight the responsibility of individuals towards a cleaner, greener and better earth to live in.